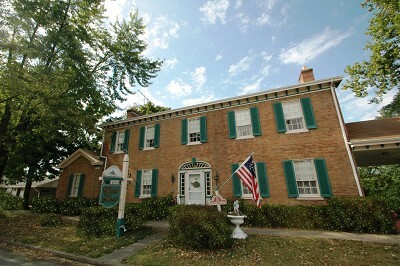 Discover our beautiful historic homes with today’s conveniences and yesteryear’s charm and grace. These picturesque homes offer loads of amenities and poise that create a luxurious and comfortable home. WOW!!! What an incredible find!! This stunning historic home is loaded with charm and character! Features include gorgeous hardwood flooring, three bedrooms, one full and two half bathrooms, a large kitchen, an extremely spacious dining room, six fireplaces, a two story barn and a small cottage. The kitchen offers hardwood flooring, beautiful wood cabinets, a fireplace, a counter bar, an island and a breakfast area. Enjoy entertaining family and friends in the fantastic dining room. It offers hardwood floors, a fireplace, a walkout to the stunning grounds and a lovely chandelier. This home also includes a first floor study with built in bookcases, a walkout, a fireplace and hardwood floors. The study is extremely spacious as well. All the bedrooms in this home are located on the second floor and every single one of them is stunning and spacious! The master suite also includes a fireplace. Enjoy the views from the wonderful porch. This home sits in the heart of it all!! Located in the Gallatin County School system, it also offers a home warranty, natural woodwork, crown molding and more. For your private tour, contact The Mike Parker Team/HUFF Realty today!! 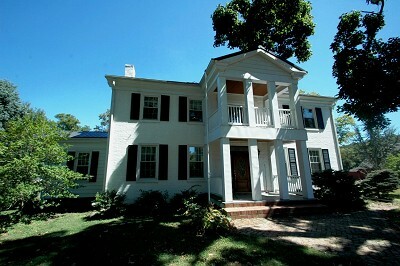 Built in 1855 this stunning Historic home is bursting with old time charm but offers all of today’s conveniences!!! Sitting on 1 acre, 6002 Petersburg offers 7 very large bedrooms, some with fireplaces, four full bathrooms, beautiful hardwood flooring, a formal dining room with a fireplace, a beautiful living room also with a fireplace, a large study, a 4 car garage, nine foot ceilings, crown molding, French doors and an in-ground pool. The gorgeous master suite provides wall to wall carpeting, an adjoining bathroom, a large walk-in closet, a fireplace and a dressing area. The bedrooms in this home are all located on the second floor and are all VERY generous in size. The updated country kitchen features rich hardwood flooring, wood cabinets, a pantry, a walkout, an eat-in area, and a solid surface center. 6002 Petersburg also includes ceiling fans, multi-panel doors, nine foot ceilings, crown molding, natural woodwork, French doors, a patio, enclosed porch, beautiful wooded lot, and so much more. This home is located in the Boone County Public School System and is convenient to shopping, the airport, places of worship, parks and more!! For your private tour, please contact The Mike Parker Team/HUFF Realty today!! What a stunning home in a breathtaking location. 411 Main St. is a wonderful five bedroom home that boasts numerous amenities. Some of them include five full bathrooms, a huge second story covered porch with an incredible view, a beautiful update kitchen, a separate guest house, hardwood flooring, generous room sizes and much more. The kitchen is awesome with its laminate flooring, beautiful wood cabients, island and pantry. The kitchen also includes a breakfast area. The chef in the family will love the kitchen. Appliances included are the oven/range, the dishwasher, the garbage disposal, refrigerator and microwave. The gorgeous great room is complete with lush hardwood flooring, a fireplace, built-in bookcases and loads of space. The master suite is divine with its plush wall to wall carpeting, adjoining bathroom, large walk-in closet, a walk-out to the covered porch and a fireplace. The master suite is located on the first floor. The bathroom features a separate shower and lovely ceramic tile. Entertain with style in the grand dining room. Complete with hardwood floors, a stunning chandlier and a fireplace. You’ll surround yourself with beauty in this magnificent home. Other features include ceiling fans, a home warranty, an unfinished basement, nine foot ceilings, natural woodwork, French doors, a Bonus Room and an incredible wooded lot. The views of the Ohio river are excellent. Reminisce with the likes of Tom Sawyer as you watch the River Boats float by. 411 Main St. is located in the Carroll County Public school system and sits in a great location. For your private tour, contact The Mike Parker Team/HUFF Realty today. 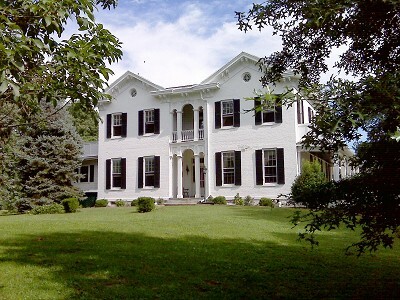 This stunning historic home sits on 2.939 acres is loaded with updates and tons of fantastic features. It offers four large bedrooms, two full bathrooms, one half bathroom, a formal dining room, a study, six fireplaces, two barns, an attached, over-sized, two car garage with a huge media room that sits above it. It also offers gorgeous hardwood flooring, a newer roof, newer windows, and newer HVAC. It also includes a beautiful sun room with stone floors and a wood paneled ceiling. 405 Cross Main St. offers city water, city sewer, central air conditioning, gas heat and so much more. The spacious living room is perfect for entertaining family and friends with it’s wall to wall carpeting and fireplace. The magnificent kitchen is a chefs dream with its hardwood floors, breakfast area, wood cabinets, island, pantry and a walkout to the dazzling backyard. Appliances include the oven/range and the dishwasher. The delightful family room is located on the second floor and is an excellent spot to entertain. It is extremely spacious and features hardwood floors, a walkout to the wonderful balcony, cathedral ceilings, and a fireplace. The master suite sits on the first floor and offers lush wall to wall carpeting with hardwood flooring underneath, an adjoining full bathroom and a fireplace. The master bath features a tub with a shower and oozes charm and style. 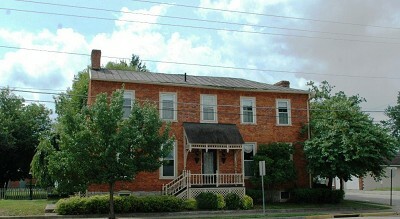 405 Main Cross St. is loaded with character and is located in the Carroll County Public School system. It features old world grace with today’s conveniences. Other amenities include a simply wonderful, spacious laundry room, a gorgeous balcony, an incredible patio, ceiling fans, recessed lighting, a water softener, a home warranty, crown molding, natural woodwork, recessed ceiling, French Doors and sits on a superb wooded, corner lot loaded with mature trees and privacy. For your private tour of this magnificent home, contact The Mike Parker Team/HUFF Realty today.